Water-soluble complex of main vitamin physiological proportion. Reduces reaction to stress factors. 1 ml contains active ingredients vitamin А - 220 IU, vitamin В1 - 0.1 mg, vitamin В2 - 0.15 mg, vitamin В6 - 0.2 mg, vitamin В12 - 1.0 µg; vitamin D3 - 20 IU, vitamin Е - 0.25 mg and D-panthenol - 0,2 mg as active ingredients. It is a concentrated vitamin aqueous solution with physiological proportion of А, В1, В2, В6, В12, D3, Е vitamins and D-panthenol. Drug components have synergistic effect on rabbits and rodents presenting metabolism normalization, increase in organism resistance, stimulation of growth and development. 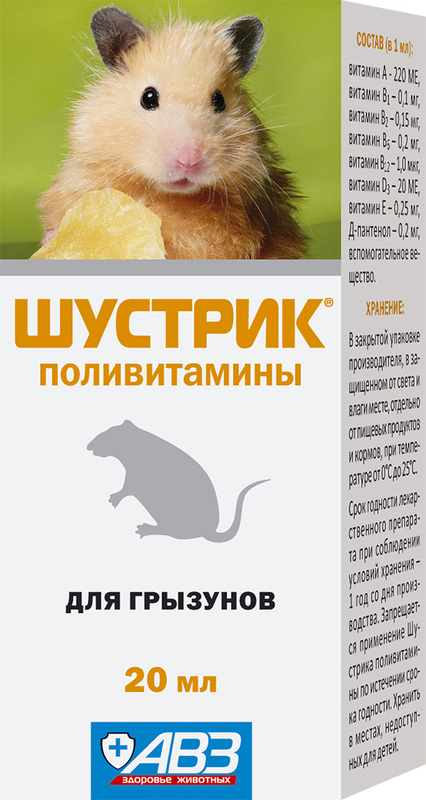 For treatment and prevention of hypovitaminosis and associated diseases in rodents (hamsters, rats, mice, guinea pigs) and pygmy rabbits; used as auxiliary in treatment of infectious, non-infectious and invasion diseases; in pregnancy (the second half), lactation, growth and development of growers; in stress situations (change in feeding rations or keeping conditions, transportation), veterinary arrangements (deworming, preventive immunizations, surgeries), reproductive function disorders. • pygmy rabbits and guinea pigs - 3 drops per 10 ml of water. For treatment and prevention administer the drug within 15 and 5 days, respectively. The drug is compatible with drugs, feedings and feed supplements. Do not use in combination with other vitamin medications. Store in closed original package at 0-25°С. Protect from light. Store separately from food and animal feeding. Shelf life is 1 year from manufacturing date.